Colony Collapse Disorder (CCD) is plaguing domesticated bees all over the world. The phenomenon causes worker bees to leave behind their queen and colony with no definitive answer to why they do so. This problem is creating a devastating impact on the agricultural industry since many crops rely on significant honey bee pollination to grow. “To understand what bees are communicating, we can either look at pheromones — the chemical they produce — or sound,” says Oldooz. “With my monitoring system, we are collecting data in real time on what the bees are ‘saying’ about foraging, or if they’re swarming, or if the queen bee is present. The data we’re collecting will pinpoint what they are actually doing.” In turn, the device will automatically analyze the data and notify beekeepers of any abnormalities, such as diseases, colony loss, and queen loss. 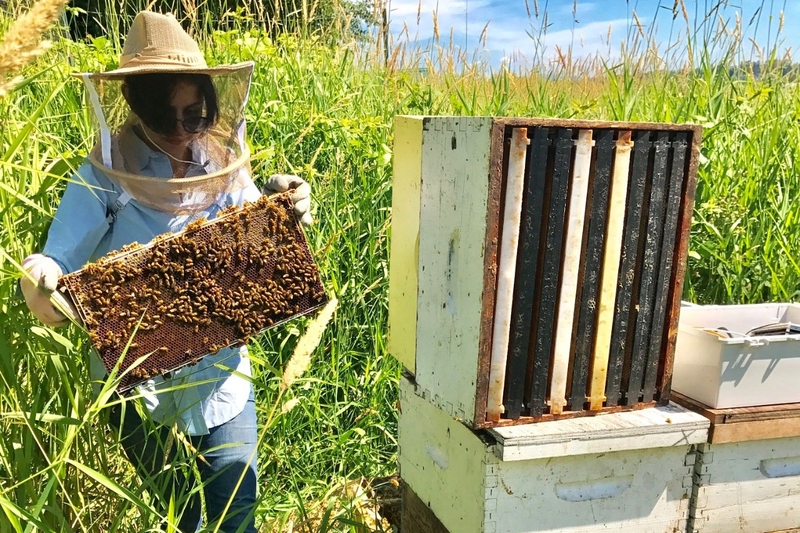 Through a Mitacs Accelerate internship, Oldooz is collaborating with Chilliwack-based Worker Bee Honey Company to further observe honey bee work patterns. The internship will allow her to conduct research in the field and then make adjustments to improve her monitoring system. Oldooz has plans to manufacture sensors at lower costs so that her monitoring system will be more accessible to beekeepers in the future. She hopes that her work will make meaningful contributions to help solve this important environmental crisis. Rewritten with permission from Simon Fraser University’s Internal University Communications Department.